Embroidery Thread, Quilting Thread, Sewing Thread, Embroidery Stabilizers, Needles & More! Red Rock Threads strives to carry the quilting, sewing, embroidery, applique and serging thread that needlecraft hobbyists and professionals need. We carry product lines from Aurifil, Floriani, Gutermann, Isacord, Mettler, Presencia, Robison Anton, Signature, Superior, Wonderfil, YLI, and more. 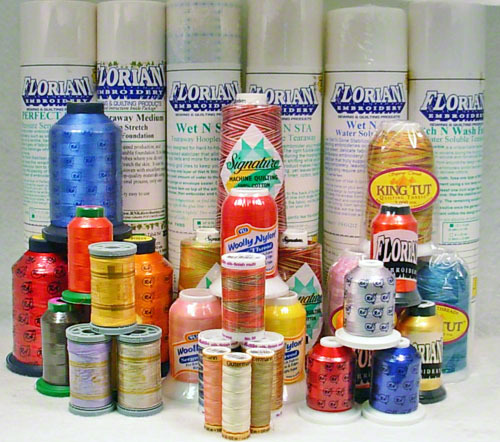 We also carry the entire line of Floriani Embroidery Stabilizers, and a wide selection of quilting patterns and sewing notions. Yazzii Bags - Yazii designs and manufactures creative, imaginative and multi-functional organizers that are ideal for Jewellery Storage, Make-up & Cosmetics Storage, and Craft Storage. Bosal Products - Bosal manufactures quality Foam, Fiber, Interfacing and Craft products. Pellon Products - The Pellon product line includes woven, non-woven, knit, tricot, weft and natural fiber products. Pellon's interfacing, stabilizers, and battings are popular with large shops and home artists alike. Eversewn Cork Fabric - Eversewn Cork Fabric is environmentally and ecologically friendly. Similar handle to leather is waterproof and stain resistant. Touch PRO Portugal Cork Fabric - Fashionable and ecological, Touch PRO Portugal's Cork Fabric can be used in production of a wide range of products (from handbags, purses, wallets, journal covers, clothes, to other accessories) that will allow you to obtain a unique product. Charles Craft Aida Gold Standard Fabric - Gold Standard Aida is up to 33% heavier than other Aida fabrics so it can be stitched without a hoop. DMC Needles - DMC produces high quality embroidery and tapestry/cross stitching needles.